HBM2 technology is awaited by gamers and enthusiasts alike, as it promises to bring faster performance, smaller die sizes and also power savings. AMD has priority to the pool of HBM2 chips available from SK Hynix, and now Samsung has begun mass production of HBM2 modules, 4GB ones, to be exact. Built upon Samsung’s 20nm process technology and HBM chip design, the chips are directed towards applications in HPCs and graphics cards. 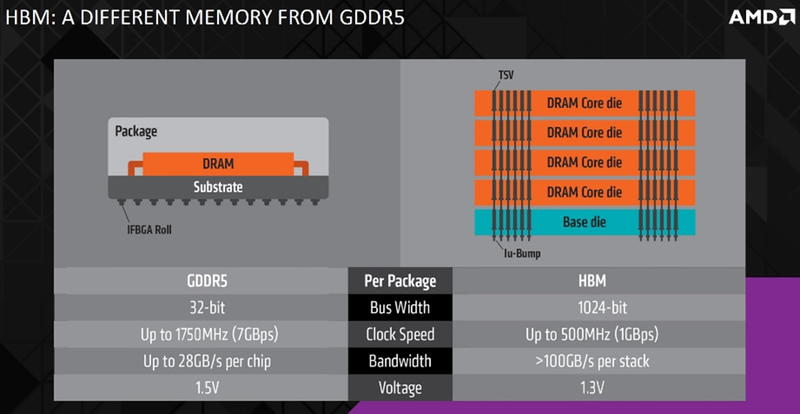 The 4GB HBM2 package is created by stacking a buffer die at the bottom and four 8-gigabit (Gb) core dies on top. These are then vertically interconnected by TSV holes and microbumps. A single 8Gb HBM2 die contains over 5,000 TSV holes, which is more than 36 times that of a 8Gb TSV DDR4 die, offering a dramatic improvement in data transmission performance compared to typical wire-bonding based packages. Samsung’s new DRAM package features 256GBps of bandwidth, double that of a HBM1 DRAM package. Samsung’s 4GB HBM2 also enables enhanced power efficiency by doubling the bandwidth per watt over a 4Gb-GDDR5-based solution, and embeds ECC (error-correcting code) functionality to offer high reliability. In addition, Samsung plans to start production of 8GB HBM2 DRAM package within this year. Samsung claims that by specifying 8GB HBM2 DRAM in graphics cards, designers will be able to enjoy a space savings of more than 95 percent, compared to using GDDR5 DRAM, offering more optimal solutions for compact devices that require high-level graphics computing capabilities. Pokdepinion: With mass production of HBM2 from Samsung started, we can’t wait to see the graphics card wars in 2016. Will AMD still trail NVIDIA or will the roles be switched? We all hope so. A monopoly is definitely bad for us consumers.